There is nothing more annoying than a product we know we saw, but don’t know where we saw it. Call it the “itch we can’t scratch” of products. In our heads, we know what the product looks like, but for some reason, our words can’t articulate it well enough to actually have a successful Google search. We know, there is nothing worse! Go ahead and call Us the “phone a friend” option that’s just been yet to be dialed! This isn’t just a familiar product we are sure we’ve seen before. No, it’s the chic crossbody that is going viral! Thanks to Amazon, everyone can jump on the crossbody bandwagon for under $15! Hurry though! The only thing worse than the one who got away? The purse we forgot, then found and then still got away, of course! 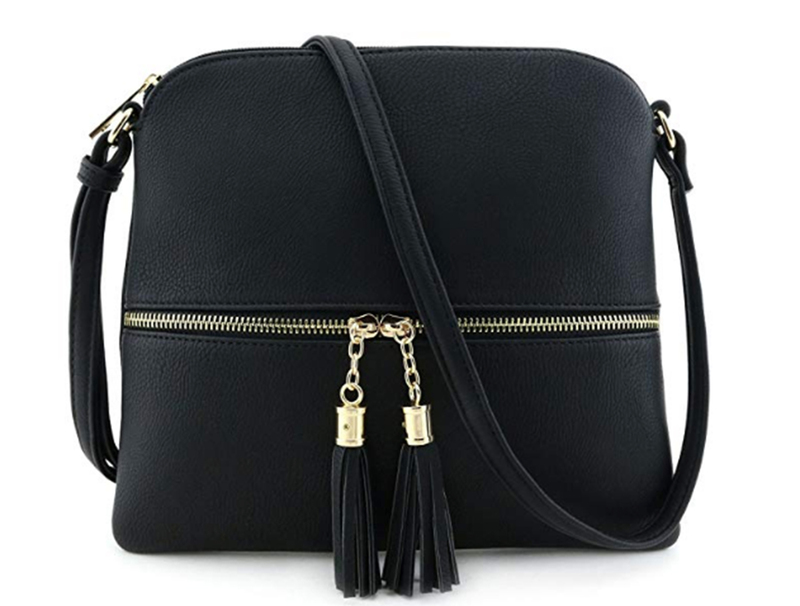 See it: Grab the Deluxity Lightweight Medium Crossbody Bag with Tassels (originally $25) starting at only $10, while supplies last available at Amazon! Please note, prices are accurate at the date of publication, March 21, 2019, but are subject to change. The Deluxity Lightweight Medium Crossbody Bag with Tassels is the bag that has left shoppers rushing to their computers to scoop one up! This bag has gone so viral, there are nearly 1,800 reviewers singing its praises! Let’s be honest, it’s only natural that most are probably scratching their heads right now. Most are probably wondering, why did this crossbody turn into such an overnight internet sensation? Let Us help break it down for everyone. When was the last time anyone found a sleek and smooth crossbody that looked so expensive but wasn’t expensive at all? Not recently? Well, that’s a good place to start in terms of the “why.” This budget-friendly purse features faux leather and gold-tone hardware and exudes so much class, it was only a matter of time before the love spread to the rest of the world. Despite being an affordable handbag option, the hardware and the leather-look material look extremely high quality. It’s so buttery-smooth, we wanted to spread the word on why we love this bag! Best of all? There are 23 shades to select from. That’s right, 23 shades! From white to black and even a mustard hue, there is a shade for over three weeks straight! Go ahead and call it the best of both worlds! This colored crossbody is not only fun, but it’s also actually functional, too! With zipper closures and a front zipper, there are functional pockets to hold, shield and support just about everything. From commuters to travelers, this crossbody is not just the life-saving option. No, we’re considering it our purse-saving one! It’s for good reason that nearly 1,800 reviewers are continuously singing this chic crossbody’s praises. From the fit to its function, shopper after shopper claims to be just as pleased as the last. So many reviewers loved how it was the ideal option when looking for something that’s wasn’t overly bulky and not too big. Many called it the perfect sized bag. Even more perfect? It’s quality. One reviewer pointed out how speechless her friend was when finding out how good of a deal this crossbody was. Talk about a seriously stylish steal. With countless color options available, it’s a no-brainer the styling options are beyond endless. Due to its super sleek style, this silhouette is the ideal design when looking for a day-to-night option. For daytime appropriate outfits, go ahead and pair it with trousers, button-ups and even tailored trenches. Slip into an exposed back mule or even a strappy sandal. Instead of slinging over our actual bodies, sling over just one-single arm. The sleek silhouette will exude elegance. It will look just so expensive and best of all no one will know the secret! For those looking to run mid-afternoon errands, this crossbody is also the ideal solution. From cropped hoodies to black leggings, this crossbody will be the perfect purse to pair when on-the-run. The ease is why it’s also ideal for nighttime use, too! When selecting one of the darker-hues (think black, blue or even the grey!) it’s perfect. Whether pairing with a short minidress, a leather legging or even a dark wash jean, this sleek style will keep outfits stunning! Don’t just look at this viral crossbody. No, no, live in this crossbody. With 23 colors up for grabs, it’s no wonder why nearly 1,8000 reviewers are calling this crossbody a must-have. Don’t worry the secret that this steal was such a deal will be safe with Us! Not your style? Check out additional crossbody options available at Amazon!